In 1974, horror fans rejoiced upon the release of Tobe Hooper's masterpiece, The Texas Chain Saw Massacre. The movie raised the stakes of in-your-face filmmaking and changed the face of horror. Twelve years later, Hooper and the Sawyer clan are back with this deviously entertaining sequel, starring Dennis Hopper in one of the most deliciously crazed performances of his career. For a decade, Texas Ranger Lefty Enright (Hopper) has sought to avenge the brutal murder of his kin by the cannibalistic Sawyer family – Leatherface, Chop-Top, The Cook and Grandpa. With the help of a radio DJ (Caroline Williams), who's also bent on putting an end to the terror, Lefty finds his way to the Sawyers' underground slaughter shop, where a battle of epic proportions will soon rage... and the line between good and evil gets chopped to bits! Twelve years after the micro-budgeted, seminal classic terrorized audiences with the terrifying, jarring sounds of a chainsaw, Tobe Hooper returned to Texas in this sequel that catches up with the raving lunatic family of cannibals. Only this time, the director departs from the intensely apprehensive cinéma vérité atmosphere of the original. Instead, he doubles the grisly mayhem with lots of in-your-face bloodletting gore, whereas as before, the violence was implied off-screen, left to the imagination of the viewer. 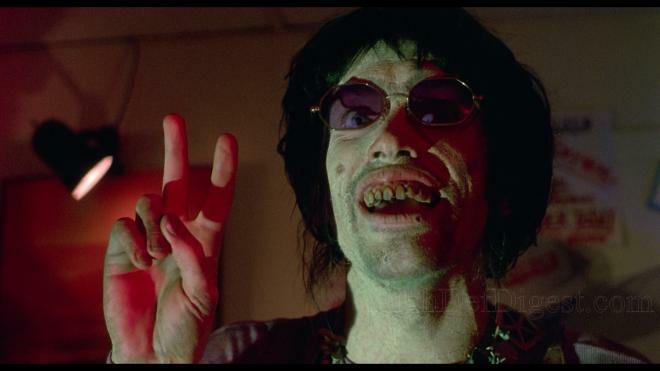 He also doubles the insanity with the Sawyer family — Drayton the Cook (Jim Siedow reprising his role as the maladjusted father), Chop-Top (Bill Moseley as the Hitchhiker's twin) and "Bubba" aka Leatherface (Bill Johnson) — acting even zanier and over-the-top than previously remembered. There is a strong resemblance to the first movie in the way the narrative plays out, following a very similar structure in that the entirety of the second half is set inside the gruesomely decorative home of the Sawyers. And like its predecessor, spending more than a few frenzied minutes with these inbred psychotics at the dinner table becomes the movie's most memorable legacy. As a direct follow-up, the family eluded capture by taking refuge inside an abandoned amusement park, which is elaborately ornamented by the bones and other leftovers of their victims. Texan resident Cary White worked on the production design, which incidentally launched a lasting career for him, and with the assistance of set decorator Michael Peal, created an eye-dazzling haunted carnival ride with fantastical, childish appeal that's also dizzyingly terrifying and nightmarish. Unlike the original, however, the uniquely scintillating set design participates in the movie's intentions of generating laughter more than scares, expanding the graphically horrid shocks into a schlocky funhouse sensibility. With stunning special effects by legendary make-up artist Tom Savini, aka "The Sultan of Splatter," the bloody slaughter appalls and disgusts, often with a wince-inducing cringe and a bad-aftertaste grimace. Such is the case in a sequence involving Leatherface, a skinned-alive country bumpkin (Lou Perryman) and an electric carving knife meant as a comically smaller version of a normal size chainsaw. 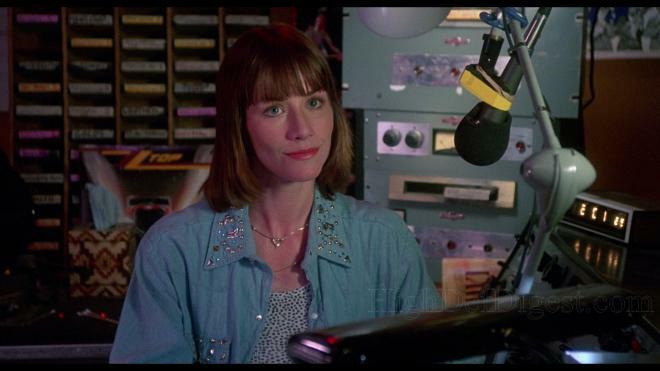 By the time we come to when hapless radio DJ Stretch (Caroline Williams) is hit over the head with a hammer by Grandpa (Ken Evert), an evocative scene harking back to the 1974 classic, it becomes all-too clear what Hooper is actually doing. Working from a script by L.M. Kit Carson ('Paris, Texas'), Tobe Hooper, the director of cult favorites 'Salem's Lot,' 'Lifeforce' and 'The Funhouse,' took his original creation into wickedly, ultra-black dark-comedy territory. 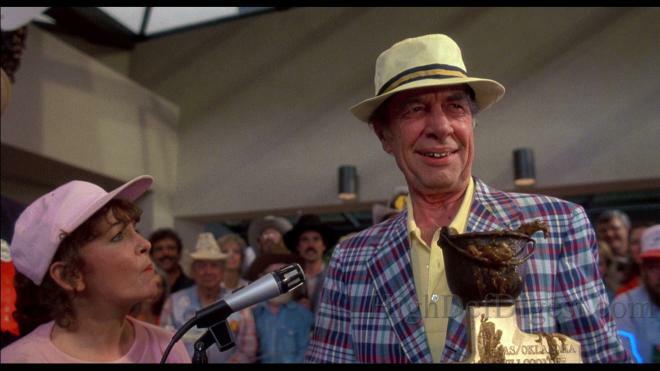 'The Texas Chainsaw Massacre 2' is a twisted, farcical satire of itself, its memory and its impact on the horror genre in general. Hooper shows he has sense of humor of the film which put him on the map and brought him to the attention of Hollywood, allowing and welcoming viewers to laugh at the gonzo absurdity that once scared the bejesus out of everyone. The film also comes with a sort of social commentary intuitiveness, besplattering the screen with the same vividly excessive violence that was becoming typical of the genre at the time and possibly even of the 1980s as a whole. When Leatherface gyrates with his chainsaw in a wantonly perverse but funny manner, Hooper makes it known he's aware of the sexual undercurrents many have read into the original. Deeper still, the unexpectedly offbeat follow-up carries an intriguingly cynical and jaded undertone, as if the director is blowing off some pent-up steam and frustration at the expense of his own creation, the vehicle that brought him recognition. After the success of his second small-budgeted, independently-financed feature, Tobe Hooper was met with a maddening experience trying to work with the Hollywood system as opposed to the creative independence which lead to the brilliant 'Texas Chainsaw Massacre.' Starting with the rather terrible 'Eaten Alive' and the embarrassing publicity nightmare surrounding 'Poltergeist,' Hooper was clearly growing disenfranchised and discontented. 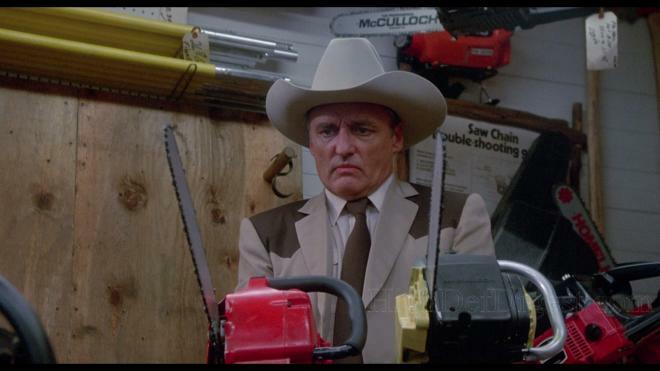 Dennis Hopper's Lefty can then be seen as a projection of Hooper's dissatisfaction and boiling grievance, walking into the home that created him with three frightening chainsaws at the ready, tearing the place apart and bringing it all down with maniacal laughter. Because after all, the saw is family. Shout! 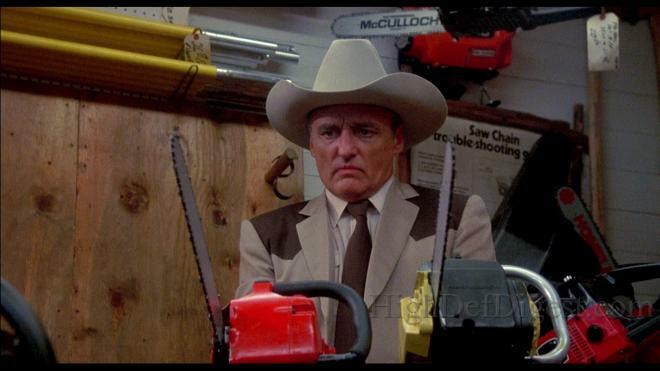 Factory brings 'The Texas Chainsaw Massacre 2' to Blu-ray as a two-disc Collector's Edition package under the distributor's Scream Factory line. The two Region A locked, BD50 discs are housed inside a normal blue case on opposing panels with brand new reversible cover art and a cardboard slipcover. The second disc contains the original MGM release along with a wealth a new bonus features. At startup, the disc goes to a generic main menu selection on the left side with music and full-motion clips. Unfortunately, according to the Shout! Factory website, the exclusive, limited edition poster of the newly commissioned artwork has already sold out. The family terrorizes Blu-ray for the second time with a brand-new high-def transfer that was made from a 2K resolution scan of an interpositive negative. Although I can’t say it’s the same master borrowed from Arrow Video’s 2013 release, the results here are nonetheless surprising and splendidly satisfying, to say the least. The source used appears to be in remarkably excellent condition, consistently showing several highly detailed moments throughout. Facial complexions are natural and amazingly revealing in many areas, especially during the hundreds of close-ups. Every wrinkle, bump and pore in Dennis Hopper and Jim Siedow’s face is sharply defined, and viewers can also make out the disgusting decomposition of Leatherface’s human-skin mask. Inside the Sawyer’s abandoned carnival home, every grotty, scuzzy piece of furniture is plainly visible, even within the darkest shadow and corners. Speaking of which, the bizarrely but creepy lit home, furnished by human remains and decorated with bright carnival lights, shows a vibrant, brilliantly glowing color palette. Contrast and brightness are very well-balanced, displaying clean, crisp whites and deep, penetrating blacks. With an ultra-fine layer of grain, giving the presentation a welcomed cinematic quality, the 1080p/AVC MPEG-4 encode (1.85:1) offers a noticeably upgrade over the MGM release from 2002. The chant of “The saw is family!” has never sounded so exciting, offering fans of the Sawyer clan, which much like the video, a much welcomed improvement over the previous iteration. As per usual, Scream Factory furnishes the twisted dark comedy with two listening options, and whether one goes with the closer-to-the-original two-channel stereo or the upmixed 5.1 surround sound version, both have their strengths, which fans will likely enjoy in equal measure. Like its predecessor, dialogue is cleanly delivered with great tonal clarity, and the other two channels display good balance and channel separation, generating a broad and welcoming soundstage with constant off-screen activity. 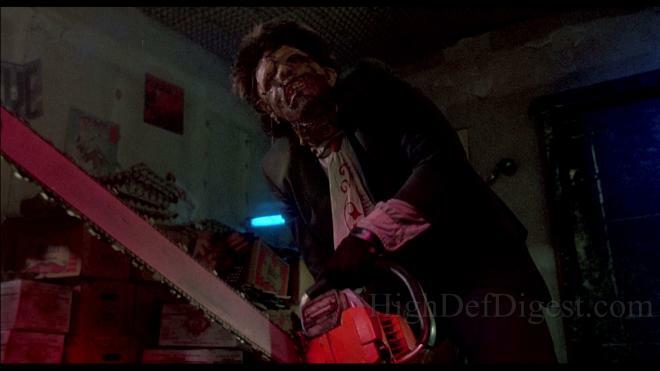 The most noteworthy improvement is a more dynamic and extensive mid-range, giving the screeching roar of the chainsaw a distinct clarity, particularly when Leatherface is grinding against metal or he participates in a swordfight against Lefty. Another notable gain in this release is a palpable, energetic low-end, providing the lossless mix with substantial weight and presence in the various action sequences. The responsive, punchy bass also gives the song selections an appreciable depth and pep, giving the Oingo Boingo, The Cramps and The Lords of the New Church tunes a hilariously ironic vigor. In the 5.1 sound, the high-def track remains front-heavy which is much appreciated, but when applying the DSU function of the receiver, very minor atmospherics subtly bleed into the sides and in the front heights. Audio Commentaries — Three separate tracks are offered here, and they're a great listen for devoted fans. The first features a nice interview-like conversation between director Tobe Hooper and documentary filmmaker David Gregory, the director of Texas Chainsaw Massacre: The Shocking Truth. Gregory throws out a variety of questions at Hooper along with some knowledgeable remarks, while Hooper provides lots of detailed, technical responses on the production. The second commentary track has special makeup effects wizard Tom Savini, actors Caroline Williams and Bill Moseley chatting with DVD producer Michael Felsher, serving as moderator. This conversation is much more active, full of humor and camaraderie as the group keeps talking non-stop, making for an awesome listen fans will love. The third track is a new conversation with cinematographer Richard Kooris, production designer Cary White, script supervisor Laura Kooris and property master Michael Sullivan. It’s an amiable chat with each sharing a variety of memories from the set and their particular involvement. They mix anecdotes with humor and some interesting technical details of the production. Behind-the-Scenes Footage Compilation (1080i/60, 44 min) — Presicely as it sounds, the piece shows cast & crew working on specific scenes while Tobe Hooper gives out directions. It Runs in the Family: Extended Outtakes (1080i/60, 30 min) — Not exactly outtakes, but more like a collection of deleted scenes & conversations that didn’t make it to the documentary. Alternate Opening Credit Sequence (HD, 2 min) — A different, eerier version of thefilm’s opening, featuring a completely different theme, from which motifs are heard throughout the movie. 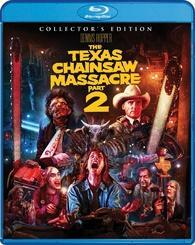 The Texas Chainsaw Massacre 2 (HD, 101 min) — The same high-def presentation as the 2012 MGM release. It Runs in the Family (SD, 88 min) — The most substantial highlight of the package is this six-part documentary that can be watched either individually or sequentially. In-depth and rather comprehensive, the feature starts off as one would expect, looking at the screenplay, origins and various other aspects of the story. With fairly recent interviews of cast and crew, except for Tobe Hooper and Dennis Hopper, the doc is a great watch about the cast, the involvement of certain key members in the production, the set design and of working with the director. Of most interest to fans, there is also some good discussion on Tom Savini's special makeup effects, of overcoming budgetary challenges and the movie's reception as well as its impact. House of Pain (HD, 43 min) — The featurette is essentially an assortment of interviews with makeup effect artists Bart Mixon, Gabe Bartalos Gino Crognale and John Vulich commenting extensively on the special effects, how they become involved and their creative process. Horror’s Hallowed Grounds (HD, 25 min) — Sean Clark of Horror Hound magazine returns for another awesome tour of various shooting locations. Yuppie Meat (HD, 19 min) — Actors Chris Douridas and Barry Kinyon, who played the loud yuppies in the opening sequence, talk about their time on the set with various anecdotes. Cutting Moments (HD, 17 min) — Editor Alain Jakubowicz is also given a few minutes to share his memories and thoughts on the production and his approach to the story. Behind the Mask (HD, 14 min) — Stuntman and Leatherface actor Bob Elmore amusingly talks about his performance, working the cast & crew and his thoughts on the movie. Twelve years later, Tobe Hooper returns to the film that put him on the map, but takes the sequel in a different direction. 'The Texas Chainsaw Massacre 2' is a twisted, gory farce that's bonkers, wacky, and downright gonzo, darkly satirizing its legacy, the graphic explicitness of the horror genre and the 80s culture of living in excess. The Blu-ray arrives with a great and significantly improved audio and video presentation, which fans will find thoroughly impressive. To top it all off, Scream Factory includes an excellent collection of supplements that should keep horror hounds busy for a while, making the overall package a must for any cult collector’s library.